Working Together to Empower the Survivor. Years in the making, Governor Terry McAuliffe recently signed into law a layer of safety for those who seek relief from the fear, intimidation and threat of lethal violence. This measure will enable individuals and families to begin rebuilding their lives outside of abusive relationships without firearms looming in the background. This is as a significant improvement in the protective order process; celebrated by and for those who advocate for and who are survivors of intimate partner violence. Empowered by measures beyond that of possessing a piece of paper, more women will seek and follow through to make their protective orders permanent now that the law gives it bones by requiring respondents to surrender firearms within 24 hours.Police now have the leverage to seek search warrants to find and seize guns of those who do not comply, and carries with it a Class 6 Felony charge with up to five years in prison. As a survivor, after it is all said and done, I am brought back to the simple fact I just wanted a divorce. That is all. I did not want to speak out against domestic violence. I did not dream my life’s calling was helping women make tough decisions about their futures, their safety and that of their children. I never saw myself as an activist who would be a public voice, or represent those silenced by abuse and lethal violence. I just wanted to move forward with my life and give my children a peaceful home. In that simple statement is the heart of what every person leaving an abusive relationship wants; to leave without event and rebuild a life without violence. This legislation provides a needed protection and is the first step in letting survivors of abuse know they are not alone now that they have backup in the legal system, and that they can move from victim to survivor, with a much lower risk of being a statistic. The journey of a thousand miles has only just begun. There remains much work still to be done. We need funding for prevention and awareness. We must continue to look for new ways to keep families safe. When they are not safe, we need to have funding for adequate shelter, resources and support for survivors. Just for today, though, let us stop to rest and enjoy this victory. Lisette Johnson is a survivor of an attempted partner homicide/suicide. She is an advocate for those experiencing domestic and sexual violence and collaborates for violence prevention education and awareness. You can read her first post on this issue published on January 25th here. Note from the Action Alliance: The Action Alliance is proud to stand with Governor of Virginia, Terry McAuliffe, as he signs historic bipartisan legislation that will increase safety for victims/survivors of ‪#‎domesticviolence‬ by prohibiting the possession of firearms for persons subject to “permanent” (max 2 year) Protective Orders. The connection between guns and lethal domestic violence in Virginia is clear: over a 10 year period, firearms were used in more than half of all intimate partner homicides in Virginia. We applaud the Governor’s willingness to reach across the aisle to enact common sense gun legislation to reduce lethal gun violence. 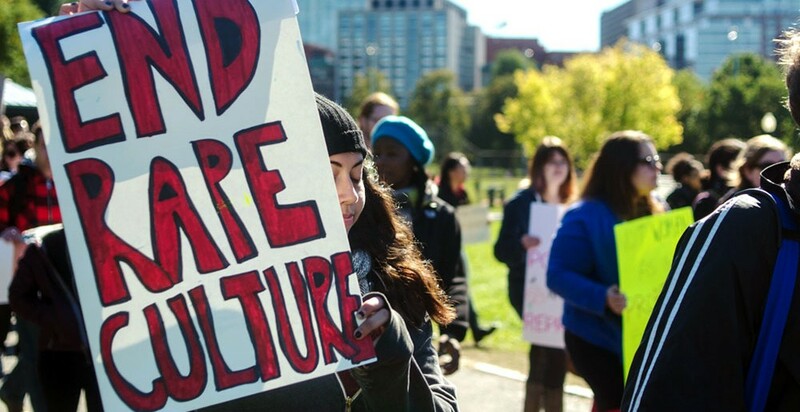 –strengthening/clarifying responses to campus sexual assault. –policies that endorse discrimination and erode/block access to economic security, safety, and equality for LGBTQ communities. Find full details in our 2016 General Assembly Crossover Report. There’s still time to make an impact on legislation, whether you support or oppose. Reach out to your representatives and let them know what you think! Find your legislators here. Kristine Hall is the Policy Director of the Action Alliance. Gynnya McMillen was 16 years old when she died in her sleep while in custody at a juvenile detention center last month in Kentucky. This was the first night she had ever spent in detention. She had been arrested on a misdemeanor assault charge on a family member. Guards used a martial arts-style restraint on Gynnya when she refused to remove her sweatshirt as part of the facility’s search and booking procedure; she was found dead in her cell 24 hours later. The tragic death of Gynnya McMillen raises critical questions about how she was treated in the detention facility and what exactly caused her death. Her story also raises broader questions about the extreme and overly punitive ways in which we approach children and teens of color whom we deem “non-compliant”. The vast majority of detained and incarcerated girls are trauma survivors. According to a study conducted by the Human Rights Project for Girls, the Georgetown Law Center on Poverty and Inequality, and the Ms. Foundation for Women, more than 80% of the girls in some states’ juvenile detention centers have been sexually or physically abused prior to incarceration. Challenging behaviors exhibited by children and teens are frequently rooted in trauma and abuse. Yet instead of being viewed and treated as survivors of trauma, girls of color who exhibit trauma reactions are often suspended or expelled from school or referred to law enforcement. Educational and legal systems fail to address the root cause of problematic behavior, which in turn exacerbates feelings of isolation and disconnection. In the face of being sanctioned, rather than supported, young survivors’ trauma reactions worsen. Sanctions grow harsher for worsening behavior, and so on. Studies on racial bias have shown that white people feel less empathy for black people experiencing pain than they do for white people experiencing pain. The same bias has been reflected in white children as young as seven. The toxic combination of individual and systemic racial bias, along with the criminalization of trauma responses results in a terrible, unnecessary cycle of suffering and imprisonment. At the Action Alliance, we believe trauma-informed work must be done from a racial justice lens. That means, in part, taking into account the impact of racism on individuals and communities. Think for example: how might these 5 tenets of a trauma-informed response operate differently when we consider them from a racial justice lens? Likewise, how might we rethink and respond to behaviors typically labeled as “failure to comply”, “defiant”, or “combative” when we look at them from a trauma-informed lens? Lincoln High School in Walla Walla, Washington is an excellent example of the stunning changes that happen when struggling teens are approached from a trauma-informed lens. At the detention center on the morning of January 11, Gynnya did not respond to a verbal offer of breakfast at 6:30am, nor for snack 2 hours later. She did not move when guards said her family members were on the phone waiting to talk to her. Each one of these instances should have been cause for alarm, a cue to check on her at a facility where policy dictates that juveniles in isolation be checked every 15 minutes. Even after she was eventually found unresponsive, guards waited 11 minutes to perform CPR on her. Gynnya McMillen is remembered as a “quiet, beautiful person” by one of her former counselors at Home of the Innocents, one of Kentucky’s largest emergency placement centers for children who have been removed from their homes because of abuse, abandonment or neglect. Gynnya should have been cared for well before she was found alone in a cell, unresponsive. Like so many other girls of color presently living in detention, Gynnya should have been cared for–by any number of educational, social, or other systems ostensibly created to help children stay safe and achieve their potential–before she ever entered a detention facility. Black Girls Matter: Pushed Out, Overpoliced, and Underprotected, a report by the African American Policy Forum, offers comprehensive recommendations for lifting up the experiences of girls of color and turning back the tide of overly punitive sanctions in favor of more restorative ones. As allies and advocates, we have the power to lift up the experiences of girls of color and center them in our work. We can integrate what we know about trauma-informed approaches into our direct advocacy work in schools and detention facilities, as well as our policy work at local, state, and national levels. We can and must risk the discomfort of noticing and talking about systemic racism while working to undermine it. We can and must show up for racial justice and for kids who struggle every day with unrecognized trauma. We can and must show up for kids like Gynnya. Kate McCord is the Communications Director for the Action Alliance. Kate’s work as a white ally to racial justice began in 2004 and has included serving for 3 years on Virginia Organizing’s statewide racial profiling campaign, serving on the Action Alliance’s Racial Justice Task Force, and raising her amazing kids to be actively anti-racist. For more information about conducting trauma-informed advocacy through a racial justice lens, register here for our February 16 webinar, “Racial Justice as Trauma-Informed Advocacy”. 2 As referenced in “The Sexual Abuse to Prison Pipeline: The Girls’ Story”: Sickmund, supra note 8; Annie E. Casey Found., KIDS COUNT Data Center, Child Population by Race and Age Group (2013), available at http://datacenter.kidscount.org/data/tables/8446-child-population-by-race-and-age-group loc=1&loct=1#detailed/1/any/false/36/13,66,67,68,69,70,71,12|/17077,17078 (last updated Feb.2015).